In the past three years, we successfully developed and delivered the Aquaculture Boot Camp (ABC) program. The ABC program offered integrated training in aquaculture production and business management strategies with “3-I” levels: Intensive, an in-depth level involving immersion in a year-long hands-on training and mentoring program; Intermediate, a mid-level involving participation in a variety of learning activities; and Introductory, a general level where sharing of information was the goal. For the ABC Intensive, a classroom/online-based course was developed based on the Aquaculture DACUM in 2013. Twelve monthly informative educational modules and materials in aquaculture production, and twelve monthly educational modules and materials in business and marketing were designed/developed and delivered in 2013. These modules were modified/replicated and delivered in 2014 based on the needs of the new participants. 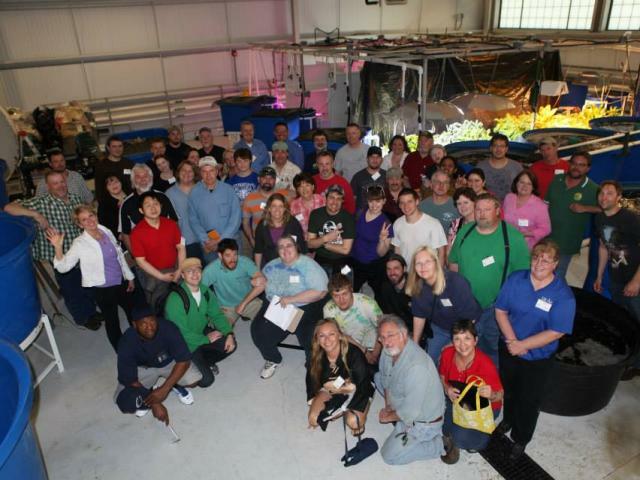 The ABC intensive level met the original goal by recruiting and training 50 potential new and beginning aquaculture farmers in Ohio. Each graduate student prepared a PowerPoint presentation describing who they are, why they joined ABC, what they learned and what they plan to do upon the course completion. A total of thirty-nine participants from both classes completed the training program and were awarded with certificates of completion. After participation in two ABC intensive classes in 2013 and 2014, students, on a scale of 1 being strongly disagree and 4 being strongly agree, reported an average of 3.5 when asked if the program met their expectations. Students indicated they would recommend this program to their business partners or relatives, and that they were clear on how to apply what they learned on the job or in their businesses. In addition, ABC intensive students self-assessed their knowledge prior to and after the delivery of the monthly content. On a scale with 1 being low and 5 being high, the overall pre-test mean in 2013 was 2.48 and 1.88 in 2014. The post-test mean in 2013 was 3.97 and 3.80 in 2014. These results indicate that ABC students significantly increased their level of knowledge of the content addressed in the program. By the end of the ABC 1 project, twenty-four new businesses/farms were created by the 2013 and 2014 ABC Intensive class graduates. For both the Intensive and Intermediate ABC students, nine aquaculture workshops were offered in 2013, 2014, and 2015. Two Aquaculture Bus Tours were offered for Introductory, Intermediate and Intensive ABC students each year in 2013, and 2014. An ABC website was created to sustainably support the target audience. Podcasts of ABC Intensive training classes and practices were developed, and posted on the ABC website and distributed to new aquaculture farmers. Several brochures/pamphlets, fact sheets and worksheets were designed as part of the learning materials from October 2012 to August 2015. Three annual conferences geared toward mostly new fish farmers were organized. Twenty-three newsletters and three magazines were published and delivered to new and beginning farmers. As a result, the ABC Intermediate program surpassed the projected number of participants by 186.87%, and the Introductory program surpassed the participation goal by 557.10%. That means that 287 new and beginning farmers gained knowledge of aquaculture production and new technologies by participating in ABC Intermediate workshops and bus tours, and more than 5,000 participants gained new knowledge by accessing ABC Introductory, ABC website tools and information, ABC/OAA Newsletter and magazines. In addition, some participants or potential new farmers who are interested in aquaculture training experience received ABC and OAA internships and mentoring. The ABC network was developed to broaden and sustain support services to new and beginning fish farmers.